The Epiphone Guitar Company of Nashville, Tennessee announces the release of the new limited edition Oh, Pretty Woman 12-string acoustic guitar. Produced in cooperation with the legendary singer/songwriter Roy Orbison’s estate, this signature guitar is based upon Roy’s own 1962 Epiphone ‘Bard’ 12-string acoustic guitar. Orbison used his original Epiphone acoustic guitar to write and perform many of his most well-known songs including perhaps his biggest hit Oh, Pretty Woman. “As a young brilliant guitar player growing up in West Texas, Roy would have never dreamt that he would one day have his own Epiphone signature guitar named after him. Roy wrote Oh, Pretty Woman on his Epiphone 12-string acoustic guitar which features one of the most instantly recognizable rock n’ roll guitar riffs and has remained iconic and fresh to this day. “I hope the next generation of artists will feel inspired to write another great rock n’ roll song thanks to the Epiphone signature Roy Orbison 12 string acoustic guitar,” said Barbara Orbison, Roy’s widow. The new Epiphone Oh, Pretty Woman is a faithful reproduction of the 1962 original and features a solid spruce top, a solid mahogany back, a rosewood 12-string bridge and vintage tuners. For this limited edition release, the back of the guitar’s headstock includes a replica of Roy Orbison’s signature and the notation for the first measure of the world famous Oh, Pretty Woman introduction riff. 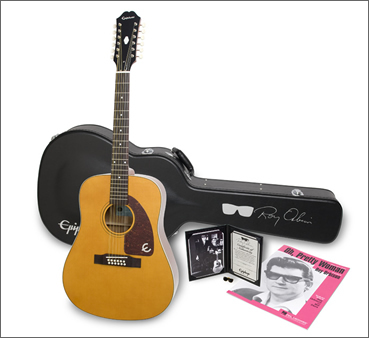 Also included in this limited edition offer is a hard case with Roy’s signature and sunglass icon on it, a certificate of authenticity hand-signed by Roy’s widow, Barbara Orbison and Roy’s son, Roy Orbison, Jr., a black & white photo of Roy with his original Epiphone Bard 12-string, a sunglass lapel pin and a copy of the Oh, Pretty Woman sheet music. The certificate and photo come in a leatherette presentation binder. The Epiphone limited edition Oh, Pretty Woman 12-string Bard outfit will be officially unveiled on Roy’s birthday, 23rd April, at the Gibson Guitar Studio in London, England. The Roy Orbison limited edition 12-string package has a US MSRP of $1332 and will be available at authorized Epiphone retailers in September 2009. Funny that you covered this guitar. I almost did. It was around the same time the Gibson Custom Shop announced the Robby Krieger SG….which I chose to post about instead. Funnily enough I was also going to write about the Robbie Krieger SG!